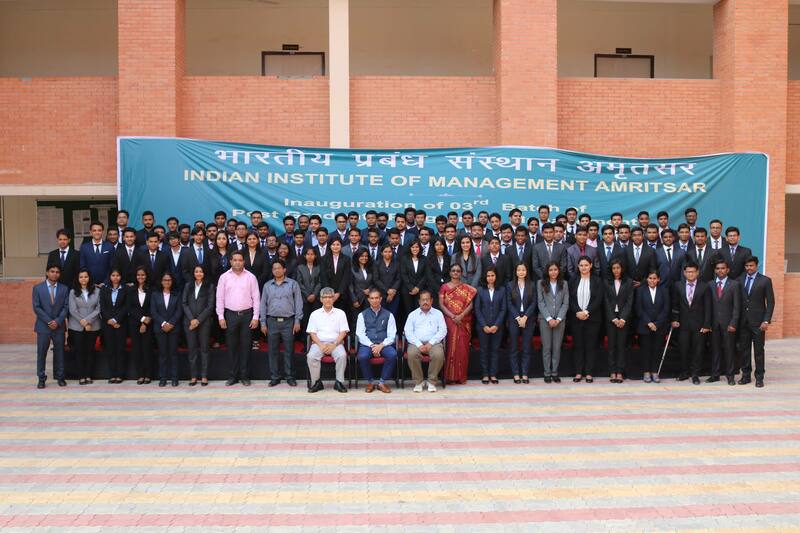 Indian Institute of Management Amritsar successfully conducted its maiden annual Finance & Marketing Conclave, ‘Pariprekshya’ on 11th November 2017. There were two panels, one for Marketing and one for Finance under Pariprekshya. The event witnessed the stalwarts from the industry discussing and providing various thoughtful and factual insights about “India’s way ahead towards Financial Inclusion” and “Digital Marketing – The new Voice of Revolution.” The eminent panel for the Finance Panel included Mr. Ashok Pal Singh, Senior Deputy Director General, Department of Posts, Mr. Prashant P Singh, Assistant Director General (Technologies) UIDAI, Mr. Sanjay Sharda, Head, Rural Distribution, IndusInd Bank, Dr. Vipul Mathur, Department of Economics, IIM Calcutta, and the discussion was moderated by Mr. Pankaj Arjunwadkar, Director, Strategy and Operations, Deloitte. For the Finance Panel, the dignitaries discussed about the evolution of Inclusion from Social to Economic to Financial sector in India. The panel highlighted the drivers of inclusion – accessibility, affordability and security. Also, the importance of an extensive network, where in people could invest in the banking institutions with a certain degree of authentication, which is provided on a massive scale by Aadhaar was highlighted. The role and the significance of the private sector banks has also been discussed. Also the need to include, motivate and translate the numbers from linkage to usage, usage to uptake and the need for including the nudges to the people, was deemed as instrumental to the success of the Financial Inclusion in the true sense in India. The esteemed panel for the Management Conclave under Pariprekshya consisted of Dr. Kushal Sanghvi, India and APAC, I-COM Global, Mr. Sandeep Balan, Head, Digital Marketing, United Breweries Ltd, Mr. Amit Tiwari, VP, Marketing, Havells India Ltd, Mr. Sourav Shah, Head, Digital Marketing and CRM, Jubilant FoodWorks Ltd, Mr. Utsav Rawat, Head, Marketing, Novartis and the discussion was moderated by Mr. Sameer Seth. For the Management Panel, the role of the Digital Marketing and the potent of the same to bring about disruptive changes in the traditional market practices were highlighted. With the advent and advancement in digital technology, data analytics, social media sphere & amalgamation of management streams, the importance of staying updated and well-equipped to tackle their impact on the overall market scenario. The unprecedented growth of the Digital Marketing has started to reflect in all the spheres of business, has impacted the millennial population working and the centennial population, as they could relate to them more. Also the nexus they have with them, as they give more power to the consumer’s choices and opinion have made this form of Marketing most promising. The Conclave concluded with Prof. Mahima Gupta’s address highlighting the key takeaways from the session. The event was a huge success and enlightened the students about the revolution in the corporate world.